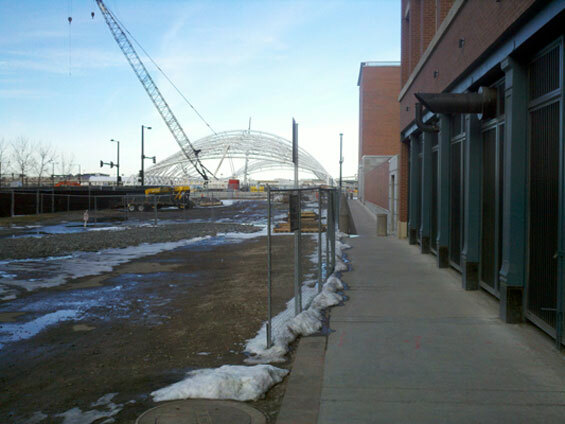 Downtown Denver is undergoing an unprecedented revitalization. At the heart of this impressive public-private transformation sits the Historic Denver Union Station and the adjacent Riverfront Park Neighborhood. Design Workshop, Inc. has been commissioned to design one of the key public spaces on the site of a former rail yard and atop a new parking garage at the center of this up and coming neighborhood. 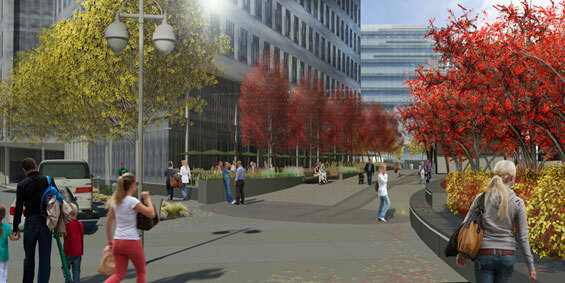 The plaza is adjacent to Denver’s 16th street mall and is a key pedestrian connection between the New Denver Union station Train Terminal and Residential and Entertainment hubs, such as the Denver Pepsi Center. This parcel represents the last undeveloped piece of land on the southwestern side of the mall as it runs through the downtown. The site area is just under 40,000sq/ft but is part of a much larger story. Design Workshop has been involved with this area since its inception. After doing the original land entitlements and master plan for this area that has nearly doubled the size of the CBD. Design Workshop has been integral to many other projects in this growing portion of Denver including iconic streets such as the 16th Street Mall Extension, plazas, bridges such as the Millennium Bridge, and transit design as well as the creation of a form based code and design guidelines that have really shaped the architecture which has begun to populate the area. This project is special to the firm because it represents the taking of an idea from concept to completion. It is fulfilling to be involved with an area from its infancy to the actually realization of a physical space. The area is quickly becoming the destination of major corporations as well as energetic urban dwellers and local entrepreneurs. 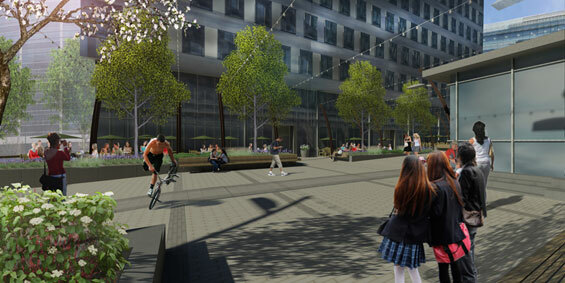 The plaza design revolves around four goals. The first was to create and active space both day and night. The design team created two edges to this space to insure activity. A bike share and parking building, the only one in Denver, was pushed to one side of the plaza while the other side is lined with the building façade activated by restaurants with outdoor patio space. This action coupled with the creation of a catenary lighting system will provide program, activity, and safety at all hours of the day as well as a dominate nighttime flare. The second goal was to reference the sites past through form giving and material selection. With the history of being a rail yard all but wiped out in the area; the design team is using salvaged rails from a nearby site and fabricating a costumed curved light pole to hold up the catenary lighting system. The paving pattern also responds to the history of the tracks with a large paving band that traces the alignment of one of the rails. This paving design is also intended to serve as a carpet to be viewed from above by the adjacent buildings and is regimented with building mullions and other architectural fenestrations. 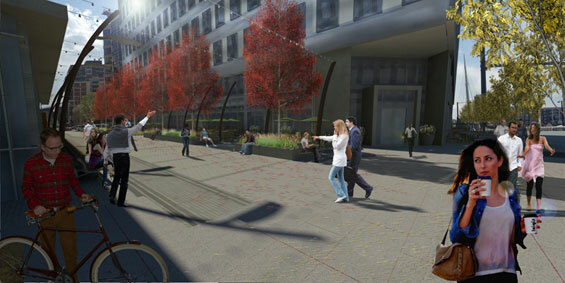 The third goal is to provide a comfortable pedestrian environment throughout the year. The design team situated seating and gathering spaces in sun pockets in the winter and then shaded them with deciduous trees for summer comfort. 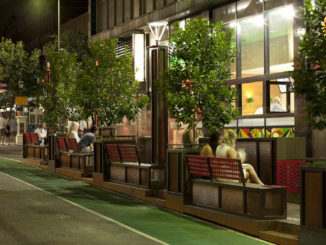 Long uninterrupted benches provide informal seating opportunities for a single person or groups of people while concrete planter walls and large steps provide seating opportunities at the entrances to buildings. Sustainability also was a driving factor behind the design. 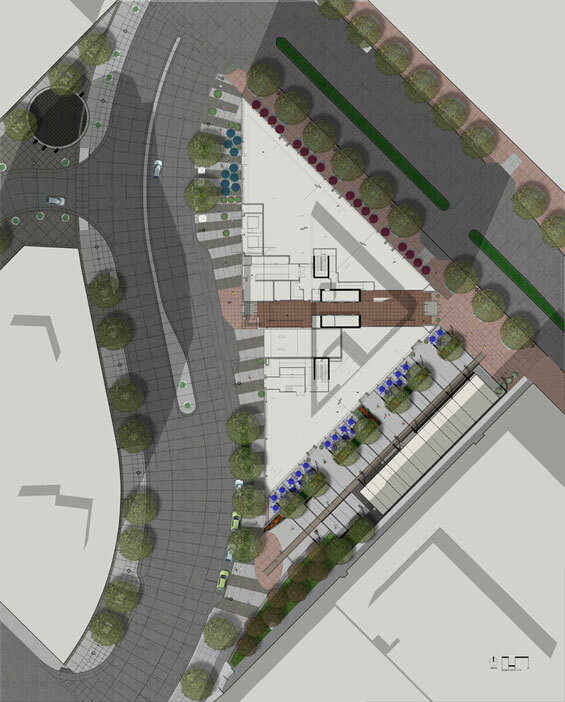 With several technical issues to overcome such as the garage structure just feet below the surface or the need for crane access within the plaza ensuring a healthy environment and design resolution was no small task. The design team is collecting surface water and conveying it through a series of underground carbon filters to cleanse it before it enters the nearby Cherry Creek. Light colored pavers with a high SRI were also chosen to curve temperatures within the plaza as well as insuring that all trees had adequate soil volume by varying the planter height based on the elevation of the garage below. Drought tolerant and hardy plants were used in conjunction with a drip irrigation system and soil technologies to also increase the health of the environment. 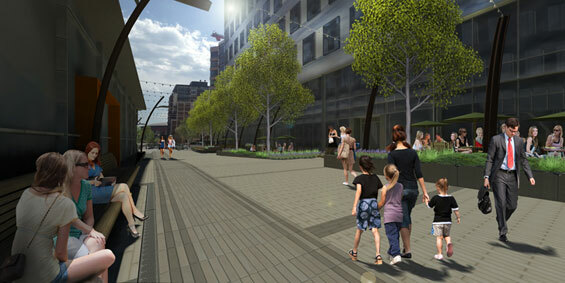 This plaza will become a new destination in downtown Denver for businesses and people. Envisioned as an energetic restaurant atmosphere at night and a hub of activity in the day the Triangle Building Plaza will be a great addition to downtown and the adjacent areas. IMAGE CREDIT | All Images are courtesy of Design Workshop, Inc.